Disability and Information: What are your rights? 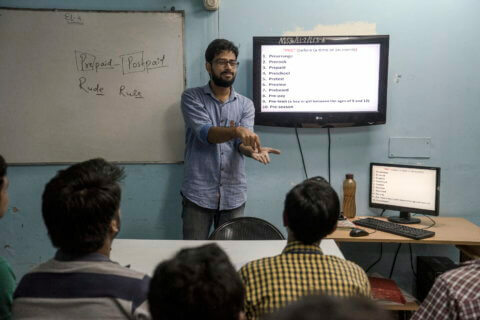 A tutor signs lessons for deaf students in a classroom at the Noida Deaf Society. People with disabilities need access to information if they are to take part in societal debates, engage in political systems, and address long histories of political and economic exclusion, because many still face attitudinal and environmental barriers to participation in many areas of life. However, many persons with disabilities are not able to access the information they need. People with disabilities should be able to exercise the same rights to freedom of expression and information as other people and through all forms of communication of their choice. The UN Convention on the Rights of Persons with Disabilities (CRPD) also protects freedom of expression and the right to information. Article 21 says that states should “take all appropriate measures to ensure that persons with disabilities can exercise the right to freedom of expression and opinion, including the freedom to seek, receive and impart information and ideas on an equal basis with others and through all forms of communication of their choice”.